Are you thinking that your life isn’t quite going the way you want? Do you feel there’s got to more to life than this? Maybe your life has just become a bit lopsided and you need to make a few changes to get things back into balance. But what is a balanced life? What does a balanced life look like? That’s the million dollar question because what my balanced life looks like is likely to be completely different to yours. To find the right balance in your life so that you can make your life better, you first need to work out your priorities. Write down the things in your life that really matter to you and put them in order of priority. When I did this exercise, family came at the top of the list, with health second and a fulfilling job third. It could be different for you and probably is. When you have your priority list sorted, take a good look and see if there is any part of your life that is missing. A friend of mine loves to tell the story of how he did this exercise and then realized that his job didn’t feature anywhere on his priority list. This always gets a few laughs but it showed him how much he hated his current job; he doesn’t have that job anymore! Your list of priorities needs to include every part of your current life; things you don’t like will have a low priority and may give you some insight as to why you are feeling dissatisfied with your life. Now make a list of the things you do on a regular basis like go to work, play sport, do a hobby, spend time with family, hang out with friends, cut the grass, commute, travel etc. Organize them into order, according to the amount of time they take up in your average week. Now compare to your list of priorities. How does your actual life compare, time wise, to the things that are important to you? How balanced is your life? OK, so now you can see where your life is out of balance. It may not be possible to make any huge changes immediately, but you can find ways to make some small changes to how you spend your time. Start small, let the changes make an impact and become habit and then move on to making more changes. Let’s look at some of the things you might consider when trying to bring your life back into balance to make your life better. One of the first things I addressed was to get better organized because I found that I wasted a lot of time doing incidental things. I discovered the to-do list; (I know, it’s not rocket science but I had never been a list maker. I think it’s because I didn’t like being held accountable, even to my own lists!). What I have found is, a daily to-do list helps to keep me focused on what I need to get done and I have found that I actually achieve more in a day and am certainly much more productive. The best by-product of making lists is that I no longer need to take work home on a regular basis, giving me much more time with the family (my top priority). A workable to-do list should contain only 6 to 8 tasks, listed in order of priority; nothing else gets done until the list is cleared. Anything not completed, goes at the head of the next day’s list. It was a bit tough to get used to but now I don’t go to sleep without my list started for the next day. I even sleep better too! Rest and recreation are important parts of a balanced life. When life gets hectic and out of balance, these are often the areas that miss out. To help bring your life into balance, make sure you get the optimum amount of sleep on most nights. Doctors still tout the old 8 hours a night regime as being the best and this is a great guide. However, some people find they work better with 9 hours, while others find 7 hours is all they need. Work out your optimum number of hours of sleep and make sure you get it on a regular basis. Recreation is important to balance your life and I like to include spending time with family, friends and people with a common interest under this banner. Humans need to spend time with other humans and if this is missing from life, it quickly becomes unbalanced. So, factor in family time, hanging out with friends and being involved in community activities to find your life balance. Psychologists recommend taking time out for yourself to achieve a life balance. We often put ourselves last in life because there’s so much to be done. Making time for yourself will actually improve your productivity, reduce stress, improve your general health and make you a much nicer person to be around. All of this will impact positively on your job and your relationships, so it’s a win-win all round. To make time for yourself, you have to plan. You need to block out time in your week or you risk not finding the time. Be disciplined and take the ‘you’ time you are owed. During your ‘you’ time, you could enjoy a current hobby or take up a new one; read a book; go for a walk or a swim or a cycle in the country; go and see a movie you’ve always wanted to see; play sport; go to the gym; take a new course; plant and tend for a garden; practise random acts of kindness; or just spend some time alone with your thoughts. It doesn’t really matter what you do with this time, as long as it is something you want to do, just for yourself and gives you satisfaction. It’s been said that a person needs three things to live a satisfying life: something to do, someone to love and something to hope for. Make sure you have these three factors in your life and you will be living a balanced life. So, can you make some changes in your life to have better balance? I always find that I never have enough time. Fortunately I know exactly where lots of it goes too – internet blogging. Lately I have tried to cut back on the amount of time I spend on the net so that I have more time for other important parts of my life. Me too. I was finding that the blog was taking a lot of my time too. I still do what I can but it isn’t top of the list. It really shouldn’t be. There are much more important things in our lives we should be investing our time in. Hopefully you are feeling better about where your time is going these days. I’m with Glen here. Life is too busy.. Like we’re working 25 hours a day, 8 days a week. So full of stress! But I’ve also come to realize that you need to stop and look at your priorities because of the things you think are important, are not. And you need to let go of those extra baggage. Agreed. I have been doing a lot of that lately, that reorganizing of my time. I hate the treadmill feeling. It isn’t a way to live. Like Glen, I feel like I never have enough time. Life is no fun I you’re constantly busy and stressed. We’ve just learned that in order for true balance, or something close, to happen we just need to choose to do it otherwise it will not happen. Agreed. I have been having a hard time lately with time demands. I have been working on really figuring out what is important and then letting the rest go. I’ve always felt a good work-life balance is very important. I’ve probably passed up a few opportunities along the way to make more money, but it’s never been worth the trade-off, which at this point would take me away from my wife and kids. Same reason that having a job with travel involved isn’t in the cards for me. Glad to hear you have your priorities right. We all should make decisions and invest in our time on the things that we value the most. Over the past couple of years I have worked hard at balancing on one foot. Once I could balance on either foot for 30, I began to move from one posture to another–trying to keep in fairly constant motion and maintain my balance. Why? Because I want to minimize the chances of falling and seriously injuring myself as I get older. Thank you so much for the reminder that I need to balance my whole life as much as I need to balance my body, and for the same reason. I promise myself to be more mindful of that. Good for you. I take pilates and yoga and this is helping with my balance and strength which will be good when I am older. I love the analogy though that if we practice a bit each day at finding balance in our whole life, we will find it. Sooo important! Great job pointing out everyone’s balance is different. I am working toward the balance with 4 kids and a husband. I am learning to make more me time, which tend to happen on my runs. Running also helps my health, so trying to multitask. Great article! Me time is so important. I haven’t had a lot lately and I have been feeling it. Hopefully I will get a recharge on my vacation. 4 kids is amazing. Kudos to you. Keep up the running. It will keep you healthy if nothing else. The most difficult thing to have is a “me time.” I have been trying to have one and most often I failed, because I kept myself connected to everything and everyone else around me that I ended up working on things I promised to forget for awhile. I would probably need to disconnect for several hours just to have that time for myself. I find that too. If I don’t physically remove myself from my surroundings, the me time and rest doesn’t happen. Hopefully you can find a way to get some soon. 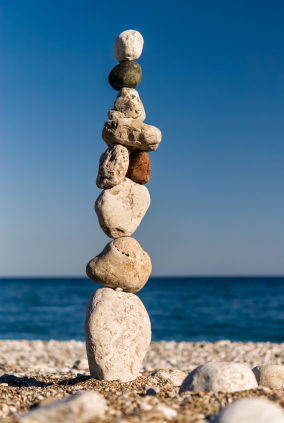 I am striving for more balance in my life as well, but some days are easier than others. We have to do lists too and they are great. The challenge is having time outside of the to do list for resting etc. Interesting. For me the priority is family, health and then financial independence. Just have to remember that getting to financial independence shouldn’t come at the expense of time with family! Very well said. I am going to hang that on my fridge. My hubby and I work pretty hard and we really shouldn’t all the time. It takes too much of our energy away for other things. Also, priorities can shift as needed from time to time. Right now my focus is on working lots and saving as much as possible for our upcoming world trip, then for those six months it’ll be about taking it slow, savouring our trip (extended honeymoon as newlyweds, really) and stretching the dollars. We have a similar priority right now. We are saving for starting a family next year. You are right though, we do have to shift when our priorities shift.